Seasonal updates on diseases, insects, weeds impacting small fruit (blueberry, cranberry, and wine grape). Fruit Pest Alerts are also available via this category feed. Subscription is through the general Fruit feed available via EMAIL and RSS. 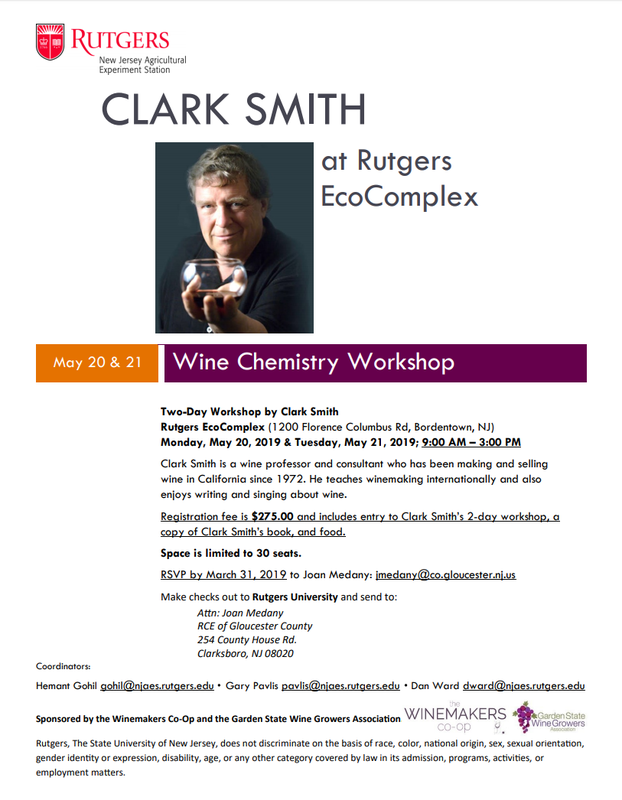 We’re pleased to welcome world-renowned Clark Smith for a 2-day workshop at the Rutgers EcoComplex, May 20 and May 21, 2019. Please register for the upcoming Wine Chemistry Workshop by sending the registration fee of $275.00 per person. Make checks out to Rutgers University and send to: Attn: Joan Medany, RCE of Gloucester County, 254 County House Rd., Clarksboro, NJ 08020. Contact Hemant Gohil at gohil@njaes.rutgers.edu with questions. 7:00 PM: Welcome Remarks and Updates. Heather Leach, Spotted Lantern Fly Extension Associate, Penn State University. Invited Speaker, Heather leach is specialist on Spotted Lanternfly (SLF). She will speak on the comprehensive understanding of SLF priorities from every perspective and provide latest information on biology, behavior and effective management techniques. Food Safety Issues Related to Tree Fruit Production. Light fare will be provided. Please call Joan Medany jmedany@co.gloucester.nj.us or call 856-224-8030 if you are planning to attend. This site is accessible to the physically impaired. If an additional assistance is needed, please contact Hemant Gohil (Program Organizer) at 856-224-8029 prior to the meeting. Cost / person: $15.00 (Checks preferred, made out to Rutgers University), lunch included. 8:25 am Welcome and Opening Remarks and update. 8:30 am A Year that was – Environmental Stress effects on Peach Development. Daniel Ward, Extension Specialist in Pomology, Rutgers NJAES. 9:00 am Key Pest Issues in 2018, and Possible Reasons. 9:15 am Peach Brown Rot: Improving Disease Control and Fungicide Resistance Mgmt. 10:15 am IPM tactics and beneficial insects in tree fruit. 10:45 am Dealing With Spotted Wing Drosophila and Scale Pests. 11:15 am Plum curculio biology and management. 11:45 am Industry Updates and NJ Peach Promotion Council Updates. 1:00 pm How Herbicide Resistance affects Weed Managing in Tree Fruit Production. 1:30 pm Pesticide Storage and Spills: Managing Risk. 2:00 pm Overview of Managing Orchard Soil Health. Megan Muehlbauer, Agriculture Agent, Rutgers Co-op. Extension, Hunterdon Co.
2:30 pm Fruit Quality and Post-harvest Evaluations of New Peach Varieties. 3:00 pm Open Session – Grower Questions and Discussion. Update Your Peach Harvest Windows!